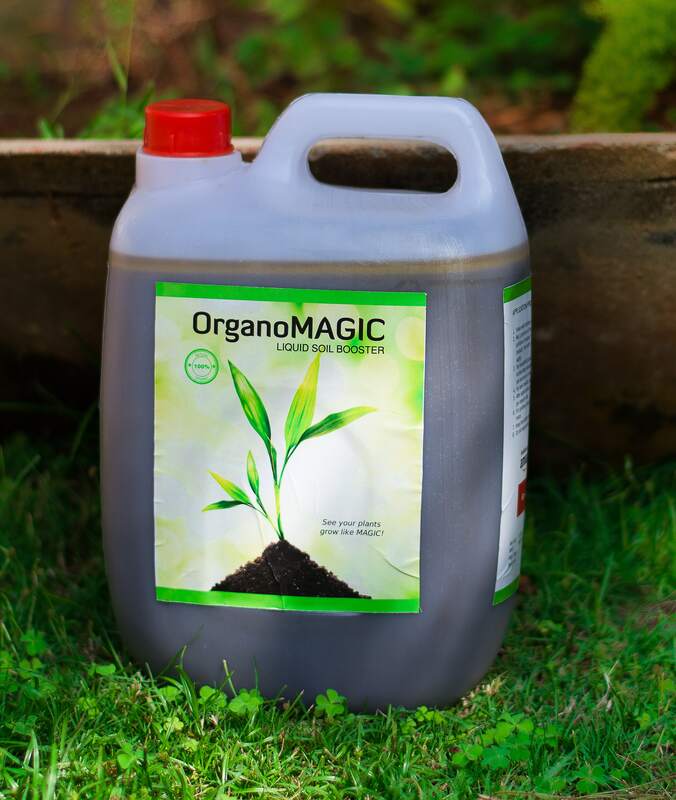 Providing the perfect medium for germination and growth, with micro and macro nutrients, OrganoMagic can be used in urban gardens, indoor gardens and agricultural fields. In the process of creating OrganoMagic every measure is taken to uphold the integrity of branding our product as “Organic”. The primary ingredient in OrganoMagic is a by-product of green technology and none of the resources are specifically harvested for the production of OrganoMagic. 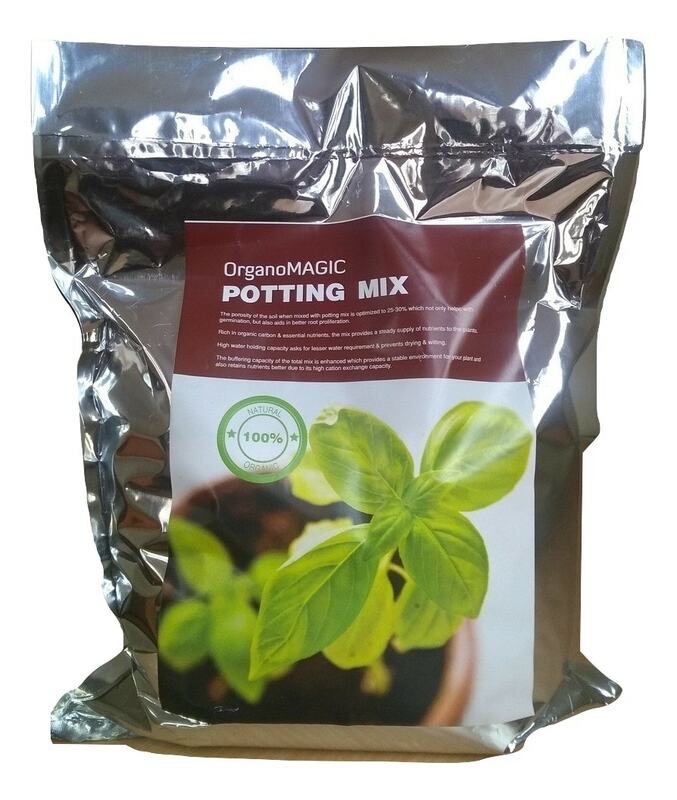 OrganoMagic Potting Mix mainly consists of Biogas slurry and an optimized concoction comprising of coco-pith, perlite & vermiculite. It consists of Nitrogen, Phosphorus, Potassium, Manganese, Zinc and Magnesium in their readily available form for the plant uptake providing a perfect medium for plant uptake and growth. It contains a high amount of carbon which fosters healthier and productive growth of the plants. Using organic matter to the soil surrounding growing plants fertilizes them, feeding and nourishing the plants, making them vigorous and lush. For best results, Potting Mix should be used during the initial stages. Within 1 week, seed and sapling germination can be observed. 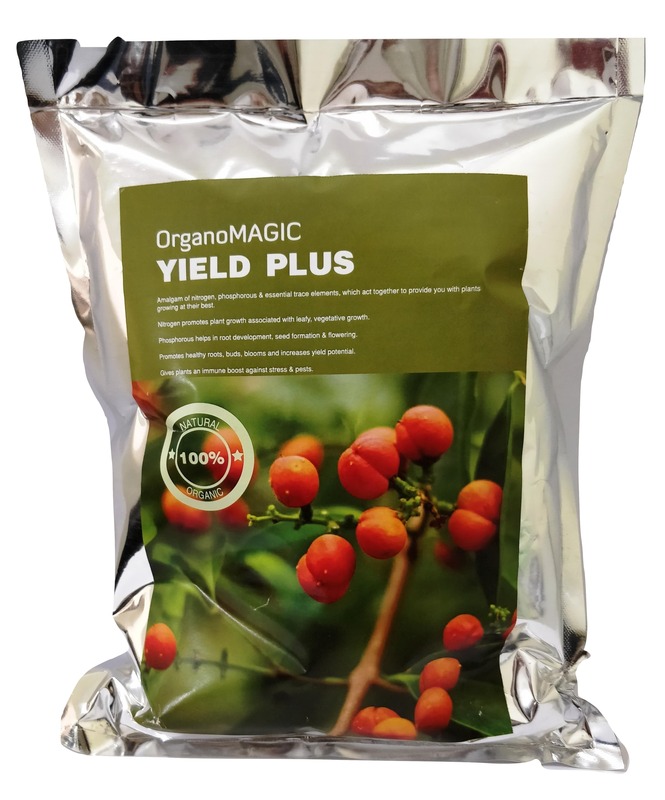 OrganoMagic Liquid Soil Booster mainly consists of Biogas slurry and a concoction of essential plant nutrients such as Nitrogen, Phosphorus and Potassium. Due to its hydrous consistency, it contains both fast releasing and slow releasing nutrients. This allows for its application to be increased and/or reduced based on the current condition of the soil. 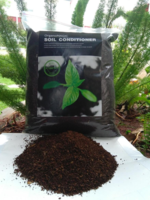 The carbon content in the liquid soil booster provides nourishment for the micro-organisms in the soil that facilitate the conversion of nutrients in the form which is easily taken up by the plant. Helps build immunity of plants, making them less prone to diseases and pest attacks. In 2 weeks, healthier looking, lush and green leaves will be visible. 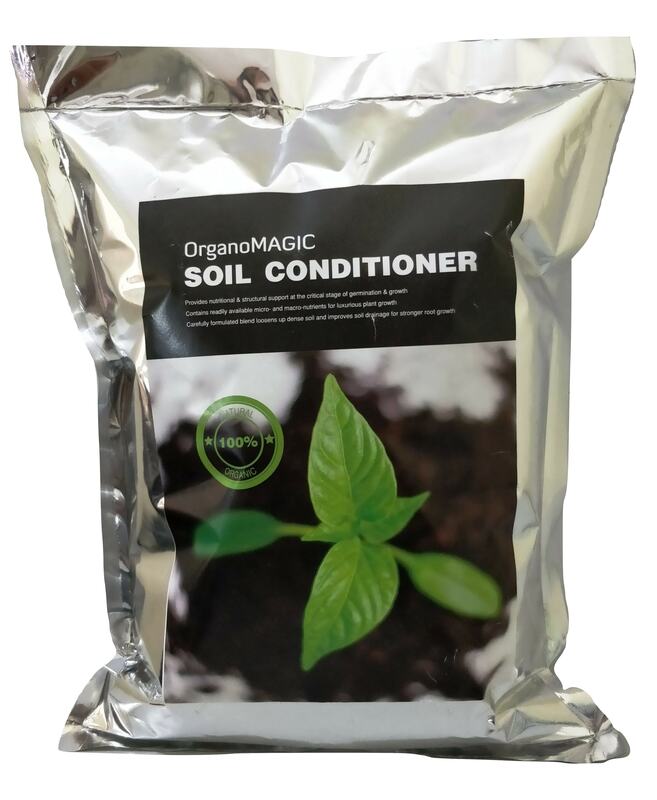 OrganoMagic Soil Conditioner mainly consists of Biogas slurry and kitchen waste compost for plants. It possesses all the major macronutrients (N-P-K) and micronutrients (Zn, Mg, Mn) providing a perfect medium for root development, germination and growth. The carefully formulated blend loosens up dense soil, reduces compaction, improves soil drainage,prevents water-logging & thus leads to stronger root growth & ultimately healthier plants. 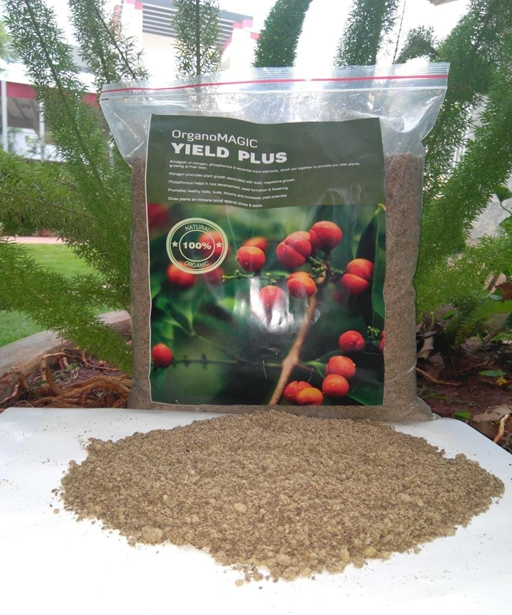 OrganoMagic Yield plus is a bone meal fertilizer consisting of Biogas slurry, soya meal and kitchen waste compost. Being the most nutrient rich among our products, it consists of all the nutrients required for better growth of vegetables, leaves and seed formation. Soya meal which is a rich source of nitrogen promotes plant growth associated with leafy, vegetative growth & fruiting. Phosphorous for plants from the bone meal is involved in energy transfers throughout the plant, helping in root development, seed formation & flowering. 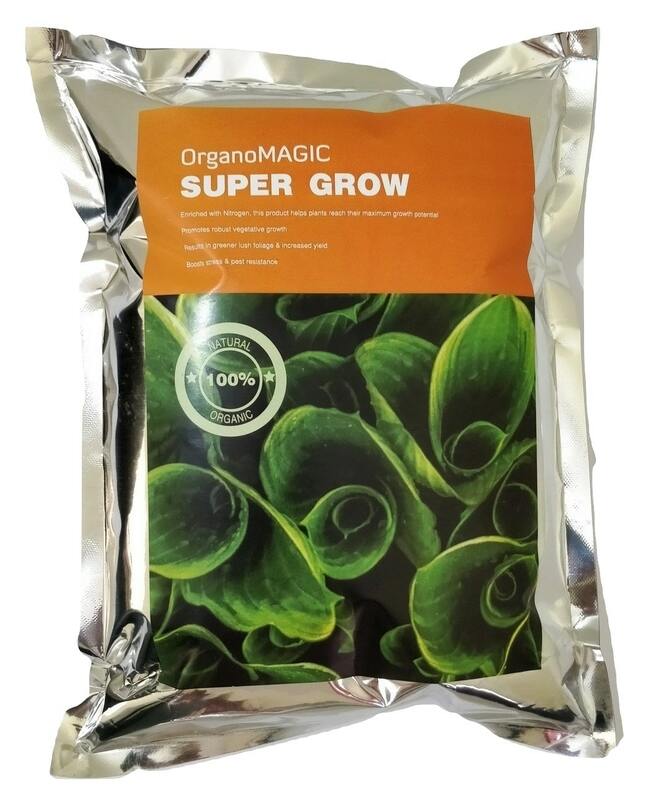 OrganoMagic Super Grow mainly consists of Biogas slurry, kitchen waste compost and soya meal. It possesses all the major macro and micro nutrients required for better growth of vegetables, leaves and seed formation. Nitrogen is an essential element of all the amino acids in plant structures which are the building blocks of plant proteins, important in the growth and development of vital plant tissues and cells like the cell membranes and chlorophyll. While it can be used for outdoor plants, it is especially suitable for indoor decorative plants as more greenish growth can be seen within 1 month. 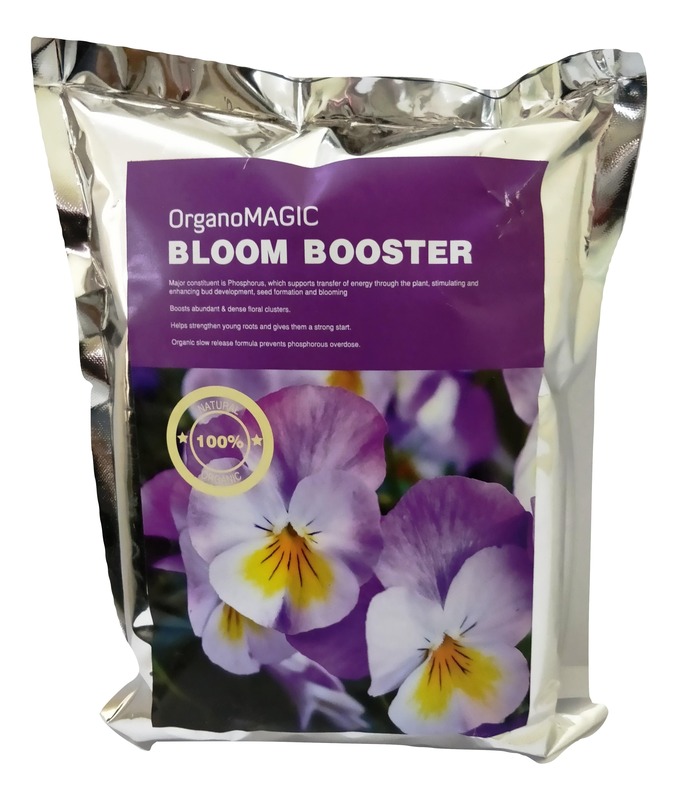 OrganoMagic Bloom Booster is a bone meal fertilizer consisting of Biogas slurry and kitchen waste compost most suited for flowering plants. 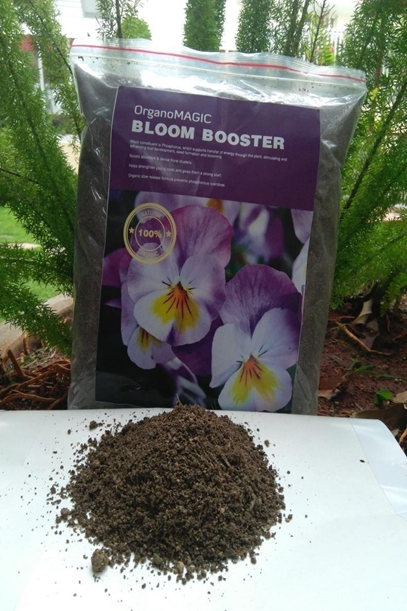 It possesses all the major nutrients making it a flower booster for plants. The organic slow release formula in Bloom Booster prevents phosphorus overdose. In 2-3 weeks, blooming of flowers and faster root growth can be observed. It is best suited for Rose, Jasmine, Marigold, Gerbera, Chrysanthemum, Alfalfa and perennial grasses.